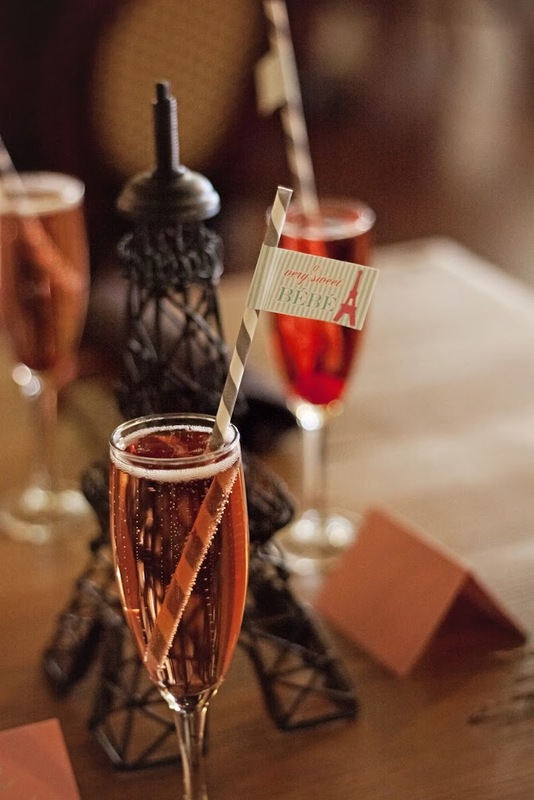 Oui Oui…Bonjour…Salad Nicoise…Baguette…this about all the French I know! For shame, I have never been to grand Par-eeee. 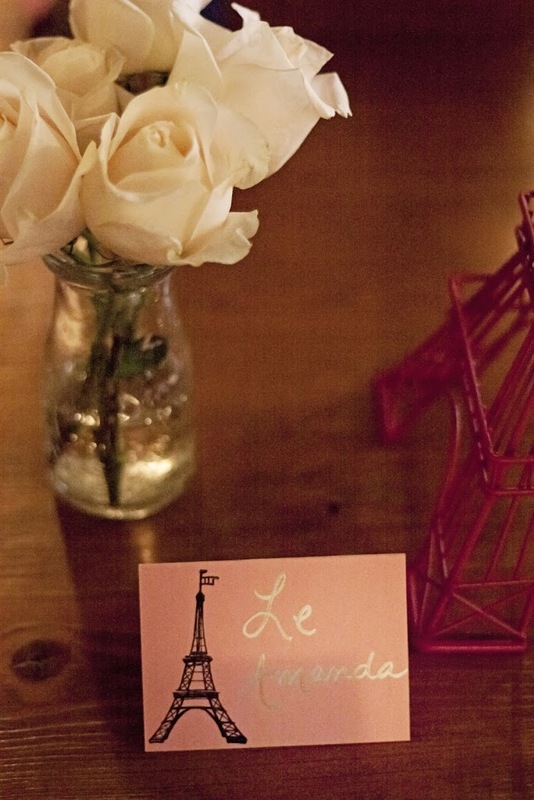 One day though, I will be there and I’ll know a lot more French. 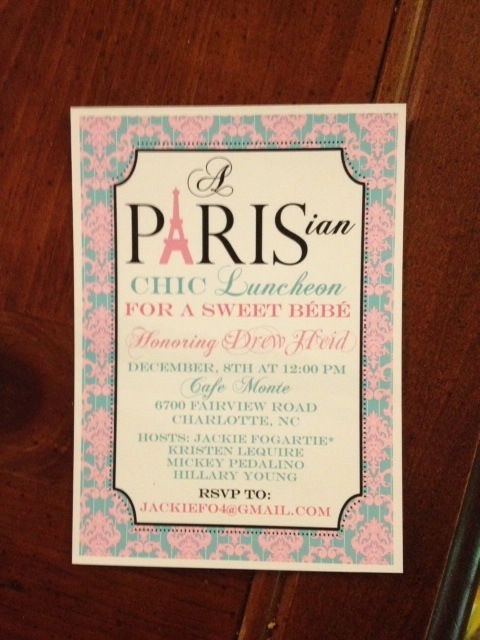 Since I’ve never been to Paris, I figured why not throw a Parisian Chic baby shower luncheon for my fab sister in law Drew? You know, the one with my cutie pie niece, Brooke? They’re having another baby girl! Cue my excitement!! Drew, in her typical humble fashion, wanted just a simple lunch since she’s already got baby clothes and STUFF galore for baby #2. In typical Jackie “over the top” fashion, I tried to do a full blown shower but it was to no avail. 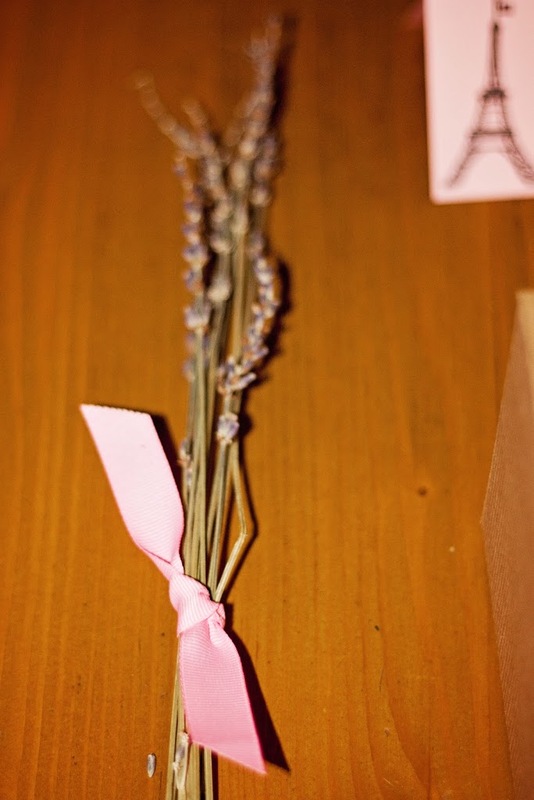 I’m still happy though because I got to throw her a fabulously chic luncheon to celebrate the new bebe. We had a small crowd of intimate guests who are close to Drew. 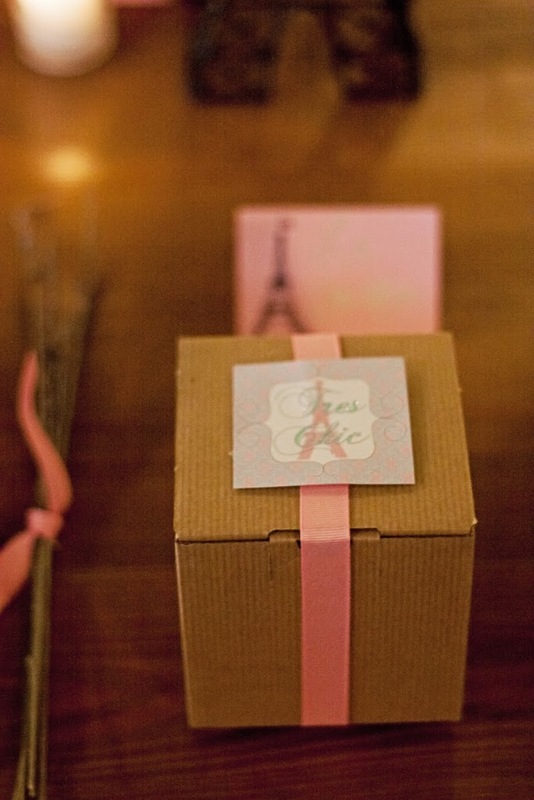 I went to my go-to invite gal Jess from Party Box and chose this chic invite to set the tone. I picked up an Eiffel Tower stamp from Paper Source (aka my weakness) and stamped the outside of the envelopes…side note, how fun is stamping? I’m a little obsessed. There’s a stamp for everything. And if there isn’t, you can make your own custom stamp. It’s absolutely stamp-tastic. 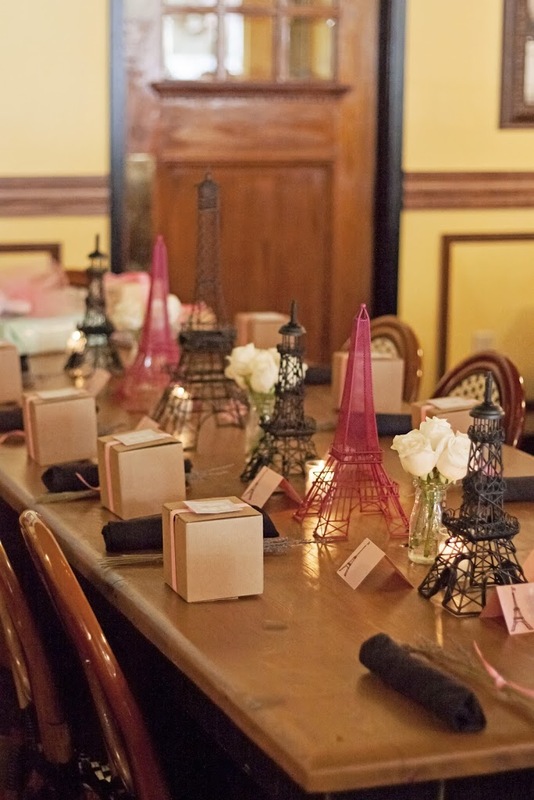 I collected many an Eiffel Tower to create a “row” of towers in the center of the table. They were from Hobby Lobby, Target and Sur La Table. They were excellent purchases, I must say. I added white roses to give the dark table some brightness. The signature cocktail was a pomegranate Mimosa (virgin Shirley Temple for the mama to be!) 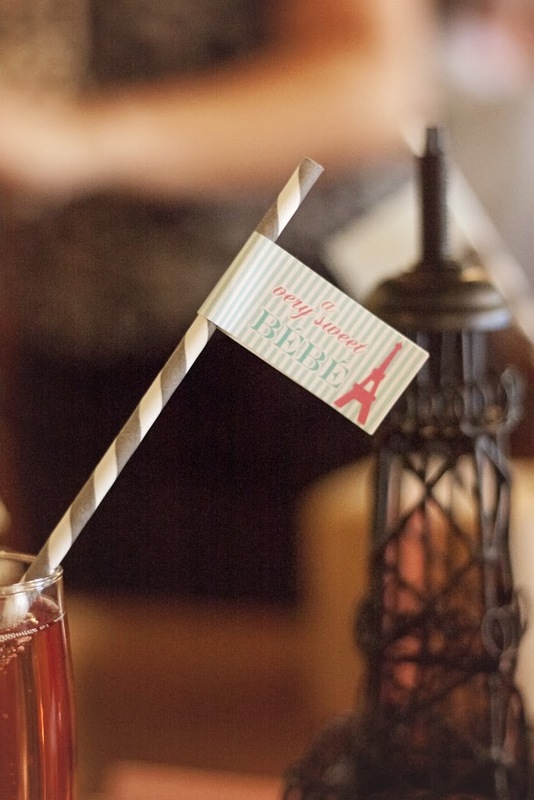 with striped straws and straw flags from Party Box. 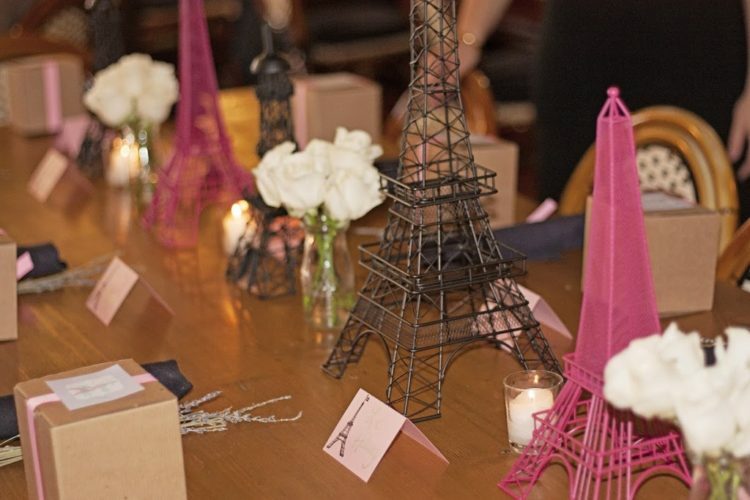 For party favors, we hit the jackpot at Pottery Barn which apparently has gone Eiffel Tower-obsessed this holiday season with a plethora of Parisian ornaments featuring the grand structure. I set the ornaments at each place setting with a sticker from the fab Party Box. Tres chic, no? How sparkly is this ornament?! It looks magnifique on my tree! Seriously, I couldn’t get a straight answer so I gave up. Here are some pics of the glowing mom and myself… Among other reasons, Drew is probably really sick of being preggers because I always touch her baby belly… it’s getting weird. It definitely got weird in the creepy moment below captured for all time…I look slightly crazy and possessed… just trying to bond with my new niece perhaps? What a weirdo. Even Drew looks scared. I’m so excited to welcome my new little niece into the world and see what kind of big sister Brookie will be! It can’t get here soon enough, right Drew?! Cute baby shower! Love all the details, and your SIL looks adorable. Congratulations on becoming an aunt again!